Along with “The Last Samurai” replica, many people are also looking to purchase “Highlander” katana. Highlander is a film and television franchise that began with a 1986 fantasy movie starring Christopher Lambert, who plays Connor MacLeod, the Highlander. Born in Glenfinnan, in the Scottish Highlands in the 16th century, MacLeod is one of a number of Immortals. Over the years, there have been five Highlander movies, two television series, an animated series, an animated movie, an animated flash-movie series, ten original novels, seventeen comic book issues, and various licensed merchandise. United Cutlery Highlander katana replica -- costs around $170. This officially licensed United Cutlery authentic replica of Duncan MacLeod’s katana is hand made of 1045 carbon steel blade and authentically detailed faux ivory handle. This sword replica has been meticulously crafted using actual prop reference materials. The handle grip is cast one piece hardened resin, to precisely match the look, feel, and weight of real aged ivory. For the first time this sword includes the unseen overcoat scabbard that Duncan used to carry this sword unseen in public. Made of genuine and imitation leather, this custom designed scabbard can be worn on the side or back, and features a fully adjustable strap harness. 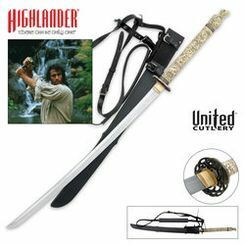 Below you can find some additional Duncan MacLeod’s Highlander katana replicas.